John Hendrix is the illustrator of Nurse, Soldier, Spy and author/illustrator of Shootingat theStars, among others. He lives in St. Louis, Missouri. "Biographies of key figures from WWII are plentiful in kids books, but Hendrix’s captivating account of the life of Dietrich Bonhoeffer is a standout . . . The combination of Hendrix’s sharp, concise words and evocative artwork gives readers a strong sense of historical context, the enormity of the perilous actions undertaken by Bonhoeffer and other resistance fighters, and the revolutionary nature of his theology of action and civil disobedience. A poignant, compellingly presented, and timely account of a brave individual who lived his life with true conviction." "Striking . . . challenging and complex." "The narrative deftly moves between Bonhoeffer’s struggles and Hitler’s ascent. Hendrix’s dynamic images complement the text, using green and red to indicate good and evil. The bold visuals will attract graphic novel fans. An excellent introduction to a great man and his fight for justice." "This book’s inclusion of detailed illustrations, ample use of quotes, and the engaging narrative all contribute to a rich telling of Dietrich Bonhoeffer’s life." "Hendrix details Bonhoeffer’s life in accessible prose, offering appropriate, meaningful context and in places using Bonhoeffer’s own words. Provocative background imagery enhances the comic’s mood and atmosphere: a noose wrapped around a church shows religious strangulation in Hitler’s Germany; prose shown on the moonlit wall of Bonhoeffer’s prison cell conveys imprisonment’s isolation. These visuals powerfully communicate the dread, despair, and violence inherent in living—and fighting against—Hitler’s Germany. " "Hendrix's uncommon style weaves nonstop illustrations with blocks of facts, imagined conversations and direct quotes from a chilling era. He helps readers begin to make sense of the unfathomable . . . 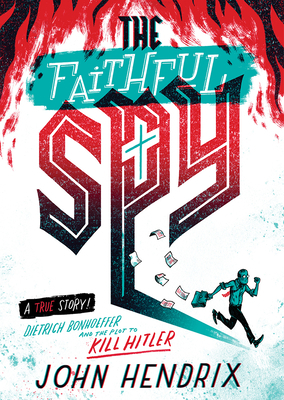 The illustrated story of Dietrich Bonhoeffer--pastor, spy and passionate rebel against Hitler's devastating Nazi regime--offers readers great insight into that period of history." "The Faithful Spy should be required reading in high school classrooms around the nation. One of the best and most original graphic novels of 2018, readers of all ages will be captivated by its exploration of just how extraordinarily brave one pastor must have been to stand up to the Third Reich! A true story of how one pastor reconciled his faith and his courage to topple the very heart of the Nazi regime, Dietrich Bonhoeffer's life and death stands as a testament that good does indeed triumph over evil." "Passionate and heartbreaking, Bonhoeffer’s choice (and the ultimate price he paid for collusion) will resonate with young people confronting a turbulent political milieu; Hendrix respects readers’ capacity to rise to a moral challenge." "The book effectively employs a hand-lettered typeface, comic-panel layouts, spot art, vivid two-color illustrations (bright green and more subdued red), the occasional map, symbol, or diagram, and striking editorial illustrations reminiscent of political cartoons . . . The result is that this heavily textual book is also a highly visual one; seemingly disparate design elements blend together seamlessly."